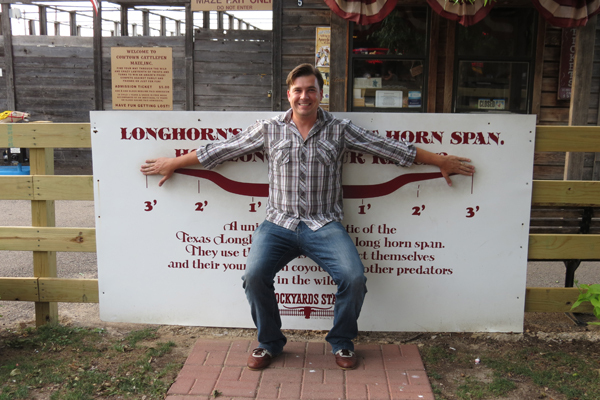 David and I had to make a quick little two day trip down to Dallas for business, and while most of the trip was focused on work, we made the most of what little spare time we had in the Lone Star State. 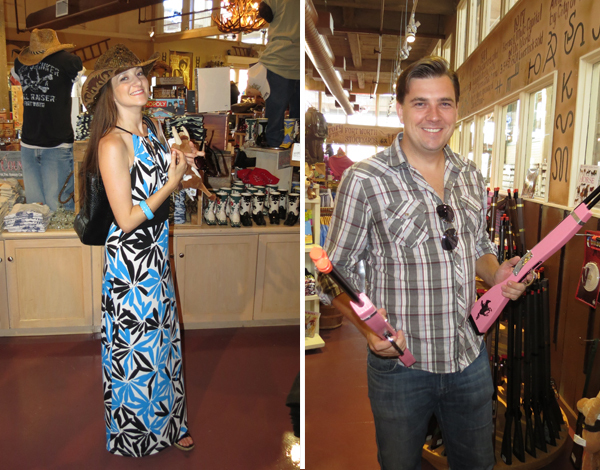 The trip got off to a stellar start. We flew Virgin America and, I have to say, it has become my new favorite airline. 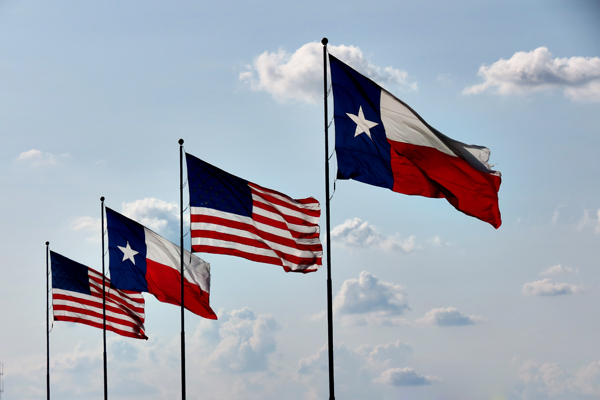 Our flights to and from Dallas were both absolutely wonderful and our cabin crews were gracious and professional. 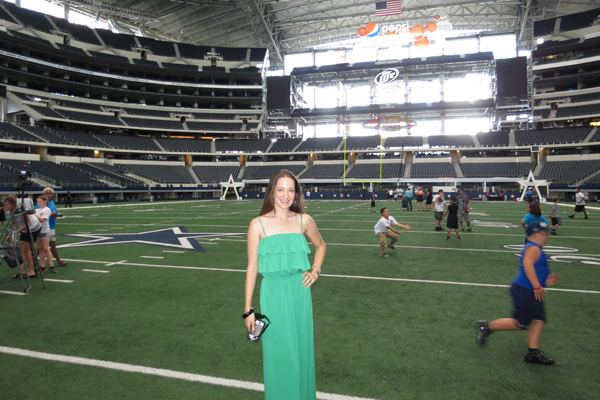 When we got to Dallas, we waited in line for our rental cars. They were apparently out of the size that we had reserved, but when David told the guy behind the counted that he wouldn’t object to a free upgrade, it made the guy smile (which made him upgrade our car). David was over the moon to discover that his California charm had gotten us upgraded to a brand new Camaro SS with only 127 miles (not bad for $30 per day!). 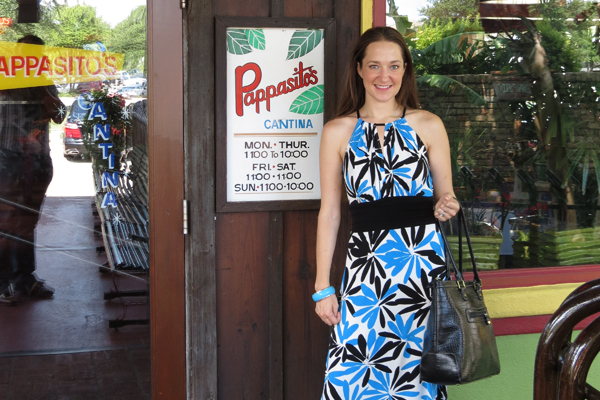 After checking into our hotel (the lovely Stoneleigh), we made the requisite stop at Pappasito’s (their tres leches cake is to die for… now if I could only figure out a gluten-free version). It was amazing, as usual, and David and I ate so much we could hardly move (thank goodness for my maxi-dress because there is no way I could have buttoned my jeans). 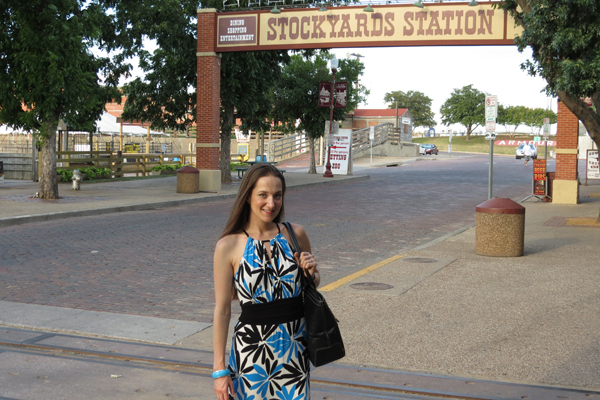 After our meal we made our way over to Fort Worth to check out the Stockyards, where we picked up souvenirs for the boys. Since it was the middle of the week, there wasn’t a lot going on, but the place was still pretty busy. The next morning we had our big meeting. We weren’t sure how long it would last, so we booked the last flight out of Dallas. Our meeting went extremely well (yay!) 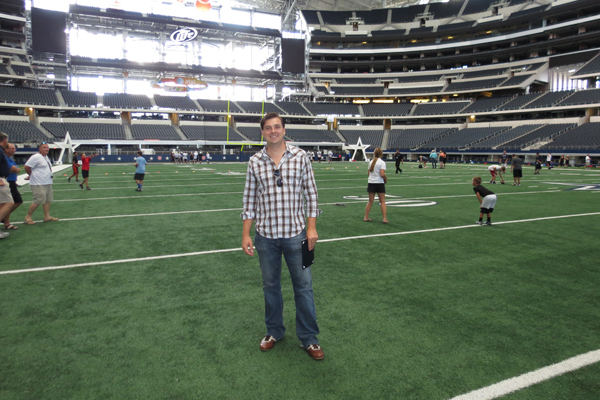 and we had a ton of time to spare before our flight so we headed out to Arlington because David wanted to check out Jerry World (also known as The Dallas Cowboys Stadium). 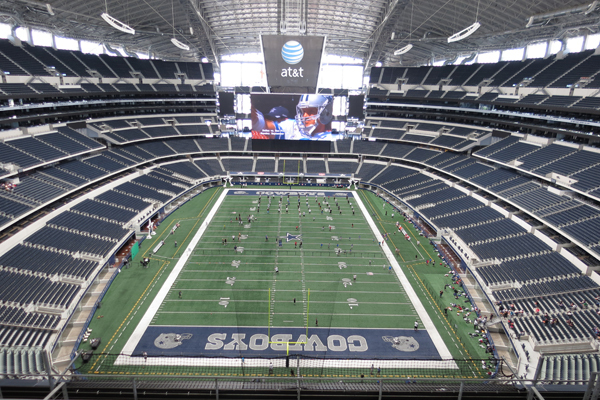 Let me just say that judging by the stadium, everything really is bigger in Texas. David purchased tickets for the VIP tour and we spent the next couple of hours in what I can only describe as football fan heaven. 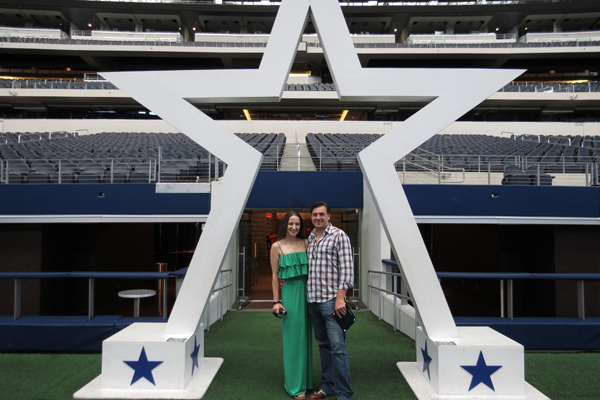 Our tour took us through the entire (massive) stadium with special stops in the Jones family “perch,” the luxury suites, Cotton Bowl offices, upper level platform (one of the six party pass platforms), the Cowboys locker room, the Cowboy Cheerleader locker room (where we got to meet not one, but two Dallas Cowboy cheerleaders… which our tour guide said never actually happens on the tour but since our tour coincided with a cheer camp, we lucked out), post-game interview room, the field club and the (best part) field. We were seriously on sensory overload and I highly recommend checking it out if you get the chance. 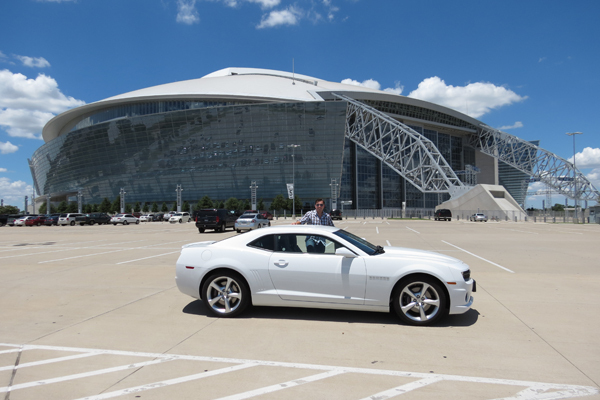 David, posing proudly with his Camero in front of the stadium. This is the view from the cheap seats. There is seriously not a bad seat in the house. And of course he had to show some love for a former Bronco. 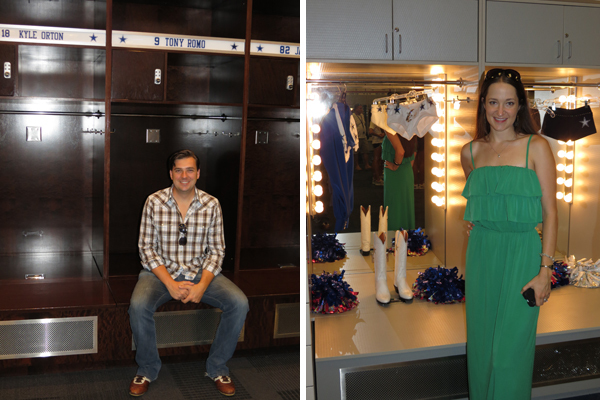 David hanging out in Tony Romo’s locker… apparently you aren’t supposed to sit there, oops! 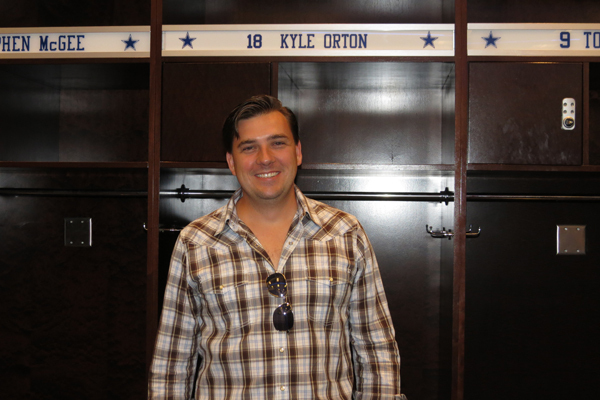 And I’m posing in my locker next to my itty-bitty uniform (haha… yeah right…clearly not everything is bigger in Texas). 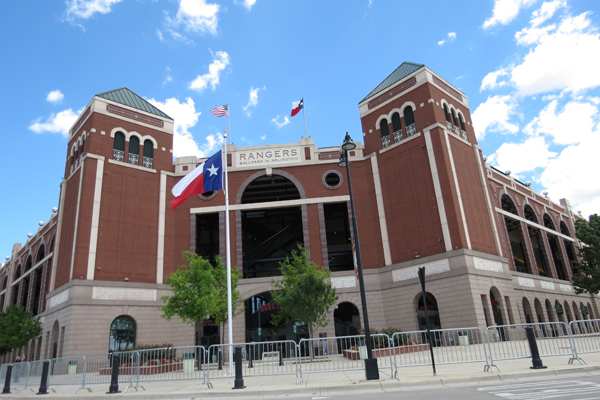 Our tour ran a bit long so we only had time to take a quick peek at Ranger’s Ballpark in Arlington before jetting off to one last stop at Pappasito’s for a quick slice of tres leches cake (we were so bad) before catching our flight. My only complaint about the entire trip was that you can only buy one type of (gross) bottled water at the Dallas Fort Worth airport due to a contract they have with one of the big soda companies (who all have gross water, by the way), but other than that the trip went very well. Finally home!!!! 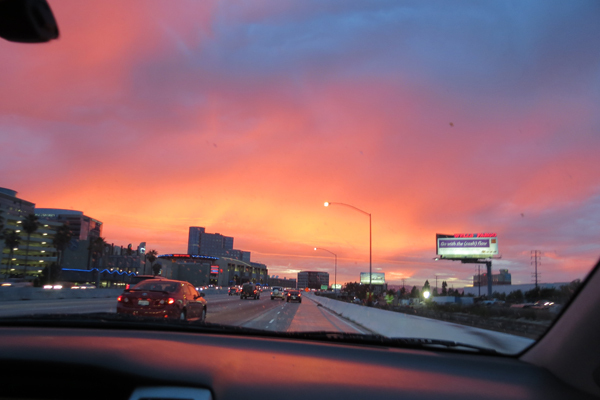 Hello 405 (Isn’t that sunset incredible?)! P.S. If you wear a maxi-dress when flying out of LAX, you will be subject to a pat down. (For the record, I didn’t think it was all that bad… it was much less distressing than my strip search at the airport in Zurich).